Updated ancient interiors. All photos by Alessandro Colazzo. 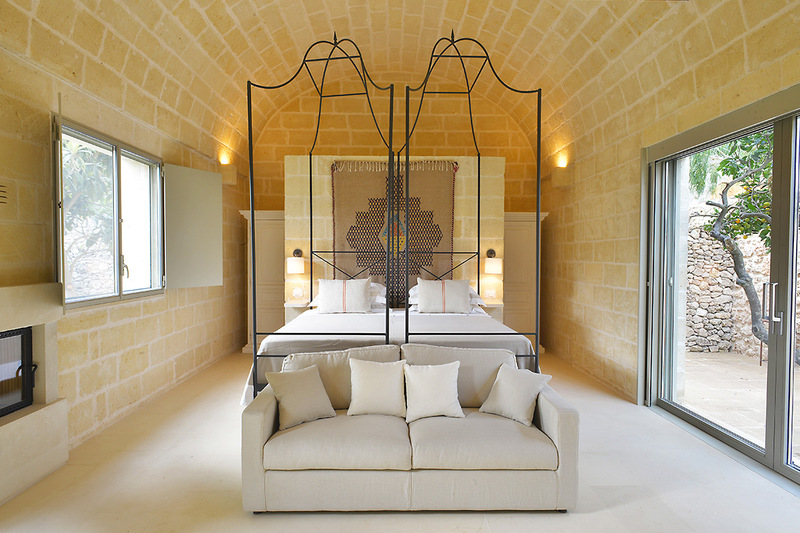 Julie Pullen checkes into a recently refurbished 16th-century farmhouse in the countryside of Puglia, Italy, where luxuries include ocean views and up-to-date ammenities juxtaposed against stunning ancient architecture. 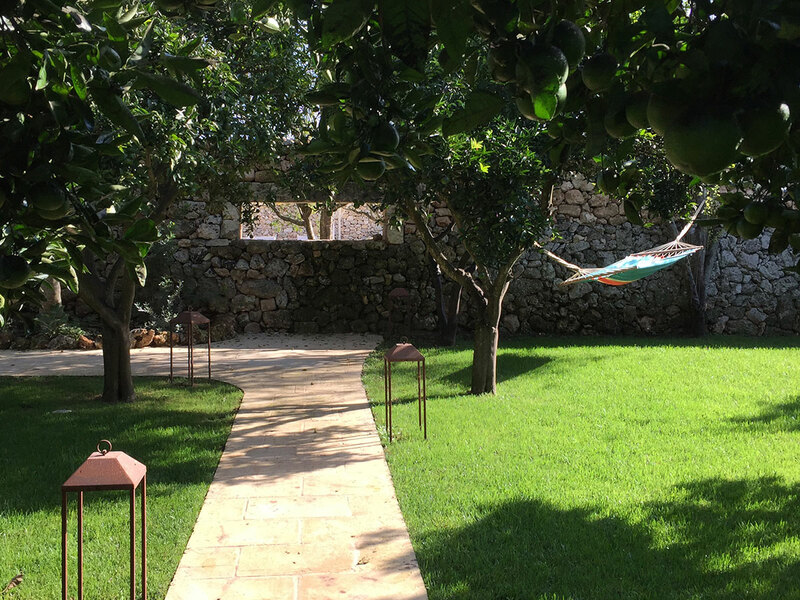 Arriving at , a fortified farmhouse ten minutes outside the baroque city of Lecce in Puglia, Italy, I felt transported to a place where orchards full of olive groves and walnut, pomegranate, lemon, and mandarin trees hum with birds and butterflies. Where the history of the land feels sublimely wrought in the timeless simplicity of the stone and iron. 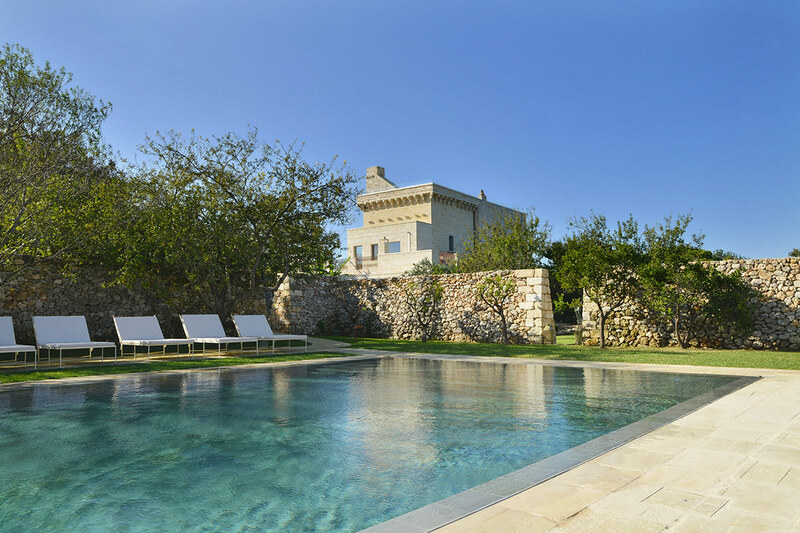 The stylish and newly refurbished 16th-century masseria has heart and soul in spades. I'm an oceanographer, and I was in Puglia to give a series of lectures at Lecce's when my aunt and I had the good fortune to be the first Americans to stay at Masseria Trapana. I will likely spend the rest of my life trying to get back to this primordial place. The courtyard. Photo by Julie Pullen. Rob Potter-Sanders, an Australian who combined a background in hotel management with a dream of having a hotel in Italy, acquired the property in a state of ruin less than two years ago and undertook a painstaking reconstruction, incorporating exquisitely designed modern touches like double waterfall shower heads, heated floors, air conditioning, and USB outlets. It opened in October 2015. 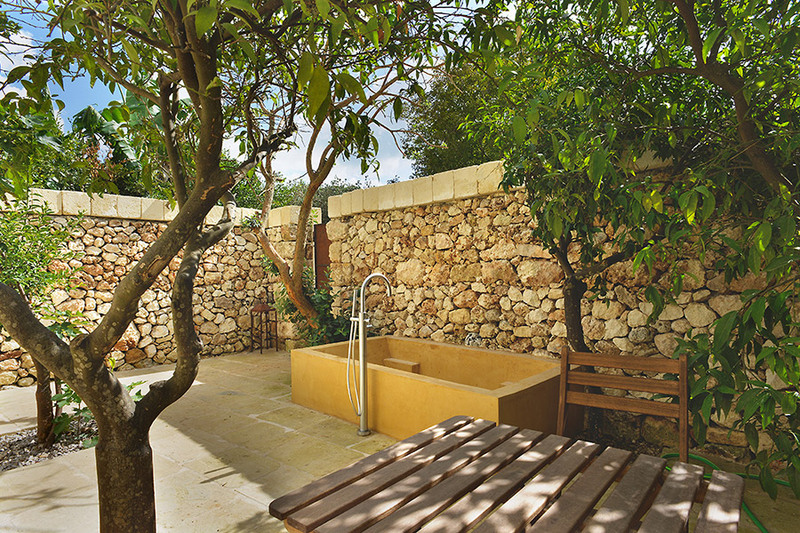 Nine suites surround the central courtyard of the masseria, a converted farmhouse. The ancient chapel at the front has stunning frescoes and a peaceful vibe. In the courtyard are an olive press and subterranean caverns that will eventually be transformed into a spa. Moroccan cushions and lanterns mark the paths, and mellow tunes play quietly throughout the common spaces. The communal gathering places include an outdoor sunken amphitheater (perfect for stargazing) and sofas and chairs surrounding the indoor and outdoor dining areas where meals are served. Locally made décor, such as woven lobster baskets and repurposed wood coffee tables, contribute to the sense of place and history. Water features like troughs, cisterns, and conduits have been preserved and restored to their original purpose of channeling water throughout the property. 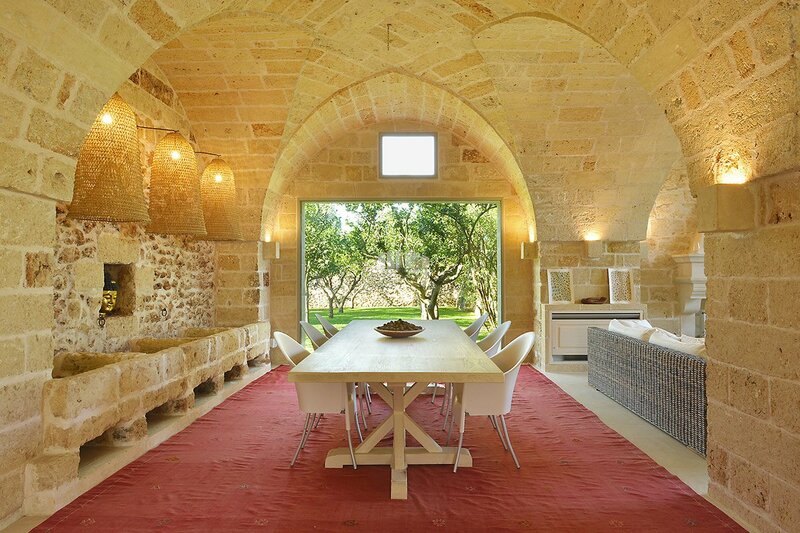 The vaulted ceilings and massive stone walls become more beautiful in each successive hue of sunlight. The huge slate tiered pool offers a refreshing respite from the southern Italian heat. Hammock-dotted gardens are lined with stone enclosures, which also contain a croquet field and game room. Yoga and massages are available on-site, and the WiFi is excellent throughout the building and grounds. Maria Carla Pennetta produces masterfully home-cooked meals that are delicious and varied. She offers cooking classes in the style of cucina povera. Breakfasts, which are included, are a cornucopia of creamy chocolate-filled croissants, pastries, fruits, and cheeses, as well as eggs and bacon. Lunch and dinner are served daily. Refreshments and snacks are available throughout the day anywhere on the property. Bathroom in the Sydney suite. Outdoor tub in the Sydney suite. The vaulted stone bedrooms are cool and airy but dark when you need them to be. Original features like ancient grain troughs create a charming environment for restful sleep under voluminous down duvets, pressed linen sheets, and huge iron four-poster beds. Rooms have armoires, sitting areas with fireplaces, and enormous bathrooms with two pottery sinks, lovely crochet-edged towels from the nearby town of Gallipoli, and Aesop products from Rob's native Australia. Suites on the ground level open onto private terraces with outdoor showers and/or enormous soaking tubs. My suite, Santa Barbera, opened onto the orchard and had a private indoor-outdoor shower connected by a floor-to-ceiling window/door. Suites on the second floor have balconies and tubs. 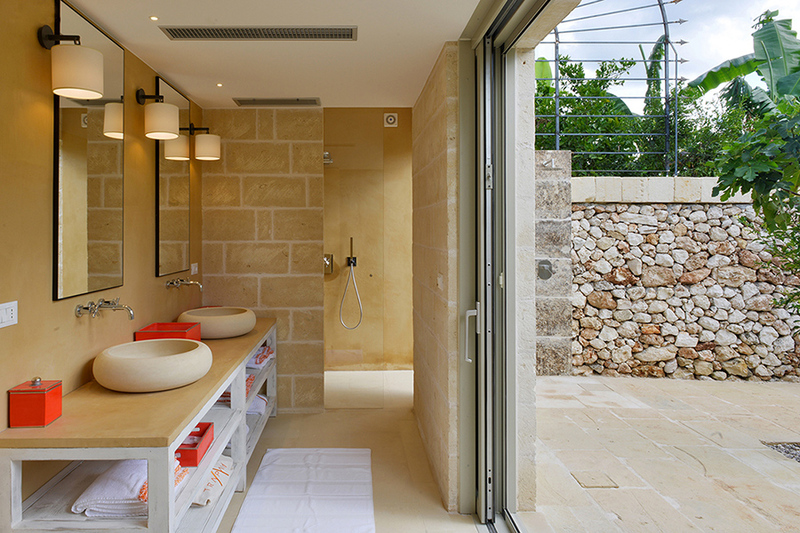 The Trapana South suite has access, via a private stone staircase, to the upper terrace with a view to the sea. Editor note: Suites are temporarily named after you during your stay, because everyone's royalty at Trapana. 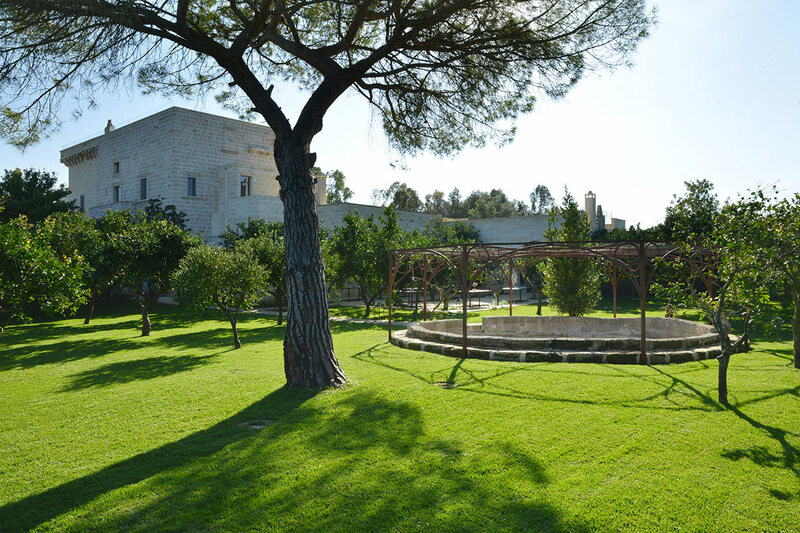 Masseria Trapana is a magic paradise for languid recharging and reconnecting, and an excellent base for exploring the surrounding countryside. Families and couples will appreciate the attentive and generous staff and the warm, personalized care. This would be a dreamy location for private parties and weddings. Anyone who wants an active on-site nightlife or any business services. 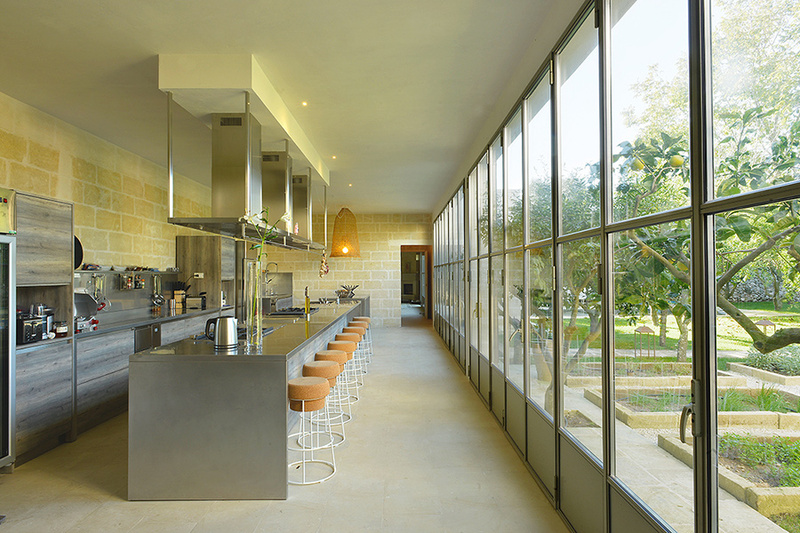 Masseria Trapana is surrounded by acres of olive groves and country roads. Slowly spinning wind turbines are visible on the horizon near the Adriatic Sea. Cacti thrive in the dry, scrubby landscape of the region. Besides an astonishing array of gorgeous churches and Roman structures, Lecce is home to , a fascinating warren of subterranean passageways and artifacts peeling away the layers of Lecce history. The seaside towns of Otranto and Gallipoli in the south are 40 minutes by car. The "white city" of Ostuni in the north and the seaside vertiginous enclave of Polignano a Mare are within an hour. Fly: Brindisi Salento airport (BDS) and Bari Karol Wojtyła airport (BRI) are approximately 30 and 90 minutes away, respectively. Drive: You'll want a car to explore Puglia. Rent one at the airport. is a scientist and a professor of oceanography and meteorology in NYC. You can follow her on Twitter at . She travels for the wonder and perspective.